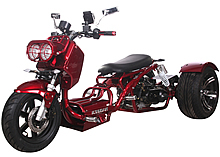 Ice Bear MADDOG 50cc Motor Trike PST50-19N with 12"/14" Extra Wide Big Tires, LED Lights, Chrome Wheels & Muffler. Free shipping to your door, free helmet, 1 year bumper to bumper warranty. Revolutionary Patented Design. Differential Driving Wheel. Extra Wide Rear Wheel. Very Bright LED Style Lights! This motor trike is EPA and DOT Approved and is registerable as a street legal vehicle in all 50 states including California. CARB approval is NOT required for vehicles under 50cc. $99.00 a year, $150.00 for 2 years, or $199.00 for 3 years (Best Deal). The manufacturer's warranty starts the day when your scooter is delivered. The extended warranty is effective as soon as the manufacturer's warranty expires. The manufacturer's warranty covers 12 months parts, if you were to add a 3 year extended warranty at only $199, your scooter's motor and other warranty parts will be covered for a total of 4 years. A 50cc MADDOG motor costs $900 plus shipping, if anything happens during the first 4 years, we will ship you brand new motors free of charge, same way with other warranty parts. Mirrors, rear wheels, battery set up and minor adjustments are required. Be sure to tighten all screws, check for appropriate levels of engine fluid and fully charge battery prior to operation. Warranty is valid straight from the box. 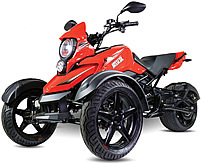 This gas motor trike is equipped with a 50cc 4-stroke engine that has an up to 35 MPH speed capability. This engine is very reliable and will outlast any other engine on the market. 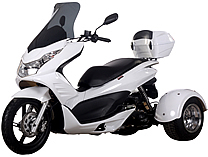 The 50cc ICE BEAR Motor Trike also comes installed with a CVT automatic transmission which is operated by the simple to use 'twist & go' throttle acceleration. With this trike, the driver will have no worries about using a clutch or gear shifting to change speeds, because it is completely automatic and completely stress and worry free. This motor trike has two starting methods that allow this vehicle to be very efficient. The electric start starting system makes simple starting even easier for anyone. The kick start can also be used at any time. The two starting systems are very convenient in the event that one cannot be used, and it is always a great alternative to have two options rather than just one. The 50cc ICE BEAR Motor Trike for sale comes with hydraulic disc brakes on the front and rear! Hydraulic disc brakes are the best possible brakes to have because they provide the best stopping power. These brakes are high quality, reliable, and very safe. 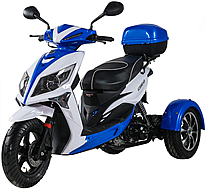 Compares to those standard gas scooters, the 50cc ICE BEAR Motor Trike offers a safe and fun 3-wheel drive for the family. A vehicle's wheels rotate at different speeds, especially when turning corners. The differential is designed to drive a pair of wheels with equal force, while allowing them to rotate at different speeds. This motor trike can get up to 90 miles to the gallon. This kind of gas mileage makes this scooter very fuel efficient and economical. This vehicle is the perfect alternative to cars and motorcycles to save on gas and keep extra money in your pocket! 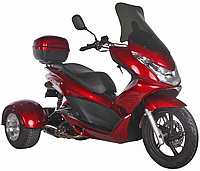 The 50cc ICE BEAR Motor Trike comes with shut off switch in case of any emergency. With one press of the button it automatically cuts the engine so you can stop easily. Due to safety concerns, passenger foot-pegs and cell phone holder are no longer available on 2017 and future models. Rear Tires: 270/30 - 14"
Government Certifications: EPA, DOT Approved, street legal in 50 States. Assembly: This Item comes 90% assembled. Be sure to tighten all screws, check for appropriate levels of engine fluid and fully charge battery prior to operation. The ICE BEAR 50cc MADDOG Motor Trike 3-Wheel Moped Scooter (PST50-19N) is 100% street legal in all 50 States including California. It will be registered as a scooter or moped depending on the state you live in. Most States do not require a motorcycle license, registration or insurance for Mopeds /scooters under 50cc. A regular driver's license would be sufficient! Please check with your local DMV or a licensing place for detail. With top speed of 35 mph, this trike is perfect for zipping around the town or to use as a daily transportation on the city roads. It has more safety features than a 2-wheel scooter or motorcycle. At 70-100 MPG and the gas prices are fluctuating, a tricycle is a smart choice for either a student looking for low cost transportation or anyone who commutes to work. Equipped with 139QMB air cooled engine, Chain driven, Differential Gear, Dual disc brakes, Bright LED lighting system, Fully Automatic transmission, 2 gallon big gas tank, 12" front wheel and 14" extra wide rear wheels, Polished aluminum rims... Be the first one to get this high quality 3-wheel beauty at unbeatable price and services, This impressive and yet inexpensive motor trike will make you famous in your neighborhood as " the person with that cool bike"!! Parts availability is 100%, we honor the warranty with no excuse.